Post-earthquake risk of traffick - Children are at high risks ! Since the civil war in Nepal, traffickers have preyed on vulnerable families in rural areas, offering their children safety and an education in boarding schools or children’s homes in Kathmandu. In practice the children have been used as poverty commodities to raise money from well-meaning but naïve donors and volunteers who support these ‘orphanages’ in the misplaced belief they are helping genuine orphans, or at least children who have no other choice than to be there. We are now deeply concerned that the earthquake will accelerate this trend beyond our worst nightmares. Aid money is flooding in to the country, children’s homes are offering hundreds of more places for children, and not enough is being done in the rural areas to stop the flow of children away from their families into profit making orphanages. 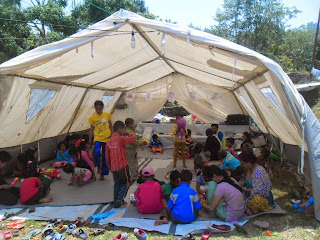 NGN is doing what it can to try and establish our own “gate-keeping project” in the worst affected district of Sindhupalchowk – this will warn families about the dangers of trafficking, and reunify displaced children.